Get it? Because it's Fast Sunday, Fast Sunday. See, the word fast has two meanings: going without food or moving quickly...anyone? Oh, I get it now. I didn't get it until you described the 2 meanings of the word fast. Hold on. Did the policeman pull him over for driving on Sunday? 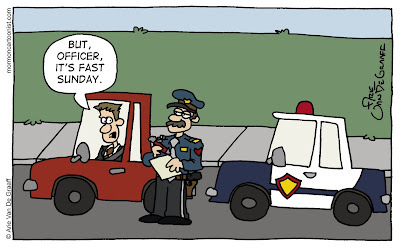 Was he driving fast because he was hungry and wanted to get home for lunch? Was he trying to get out of a ticket by convincing the officer that he's a religious man? Hey . . . wait a minute! The word "fast" can have two meanings! Now I'm laughing. I'll admit, this isn't my strongest work. But I've got a joke next week from a faithful reader (and commenter)that's going to kill. Gives a new meaning to being a Sunday driver!